We had a wonderful time visiting with my parents and a great time at our cabin getaway. It was in the middle of nowhere and we had no signal for phones or computer or TV. Just quietness. It was nice. But by the end we were ready for our noisy kiddos. We had a great time together, but we were ready to be a family again. I cannot wait to show you all the pictures of the cabin later in the week! So quirky and incredibly cute!! Right up my alley and I suspect right up your alley, too, for most of you. So check back for that, you won't wanna miss it! In the meantime, I have no new projects to show you since I just got back from our little vacation, so I decided to share another party with you. 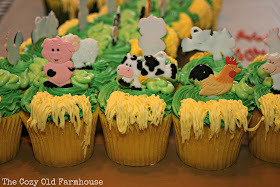 Several months ago, well more like last year actually, I wrote about our daughter's 1st birthday where we did a cupcake theme (see that HERE). 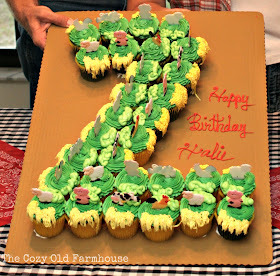 By the time her 2nd birthday rolled around we lived on a ranch and she was in love with horses and cows and animals in general. 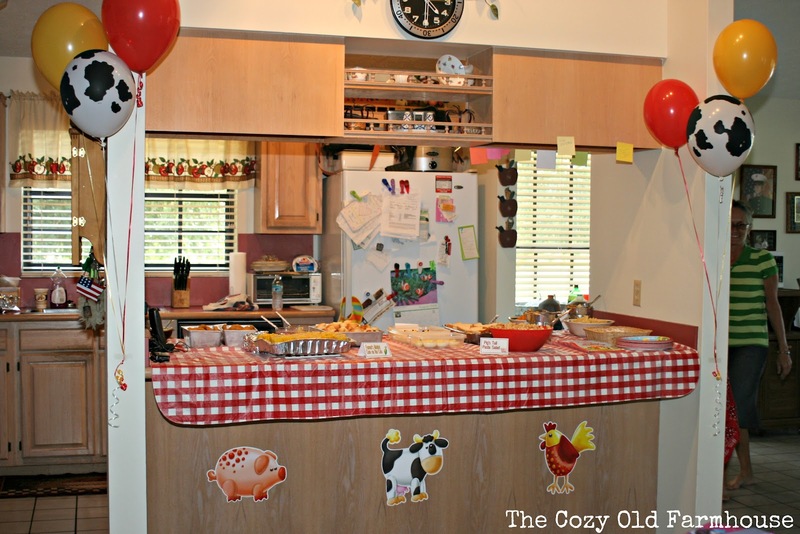 So we decided to do a barnyard theme. Now remember, this was years ago, before my blogging days so the pictures are a little lacking, but you'll get a good idea of it all. We had the party at my in-laws home and this was what you saw as you walked up to the front door. My cousin let me borrow her antique toy tractor, we bought a hay bale at the feed store, and I brought some of H's stuffed animals to set on top. The "barn door" was ordered online. 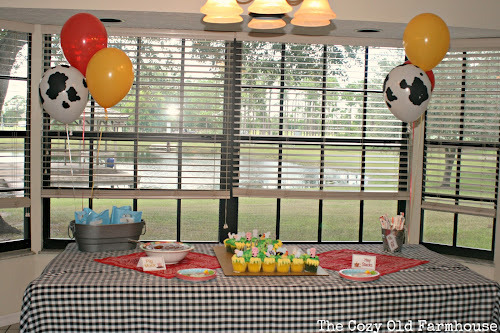 This was the cake table. We used lots of red and yellow to match the plates and things I bought. The black checkered tablecloth I borrowed from my mom. It was actually from my brother's wedding rehearsal dinner 12 years prior to this! 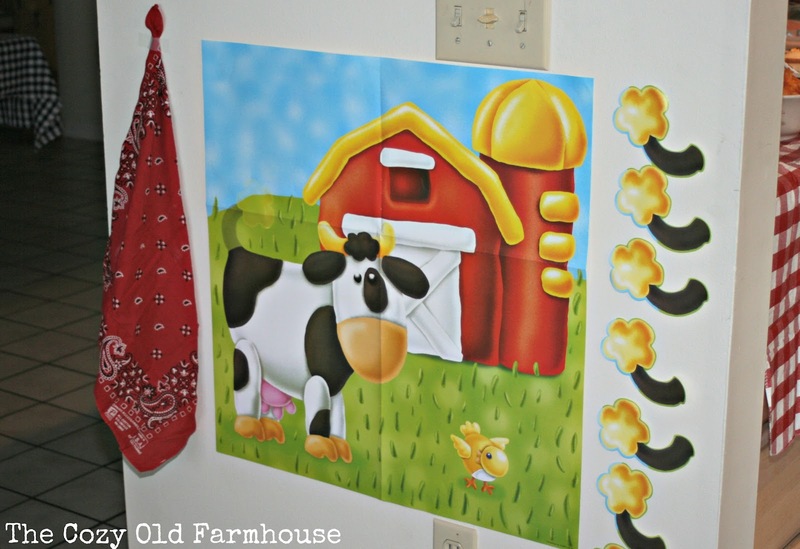 I was in love with those cow print balloons! They were so cute! 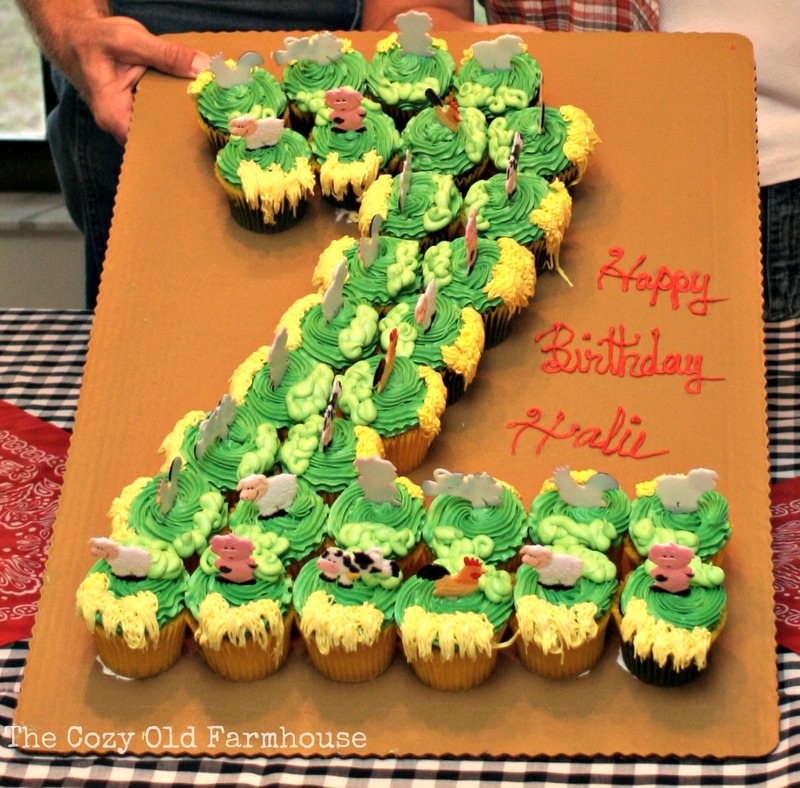 Instead of an actual cake, I had cupcakes made and shaped into a "2." I ordered picks to place in the top of them. These weren't actually the ones I ordered, the company messed it up but it was too late in the game to replace them. They were still cute though. 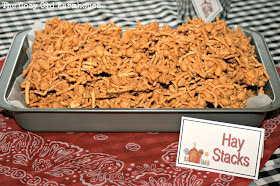 Almost all of the food had some kind of a farm name or reference, and I made up little name cards for each one. "Pig Muck" was actually just chocolate pudding. 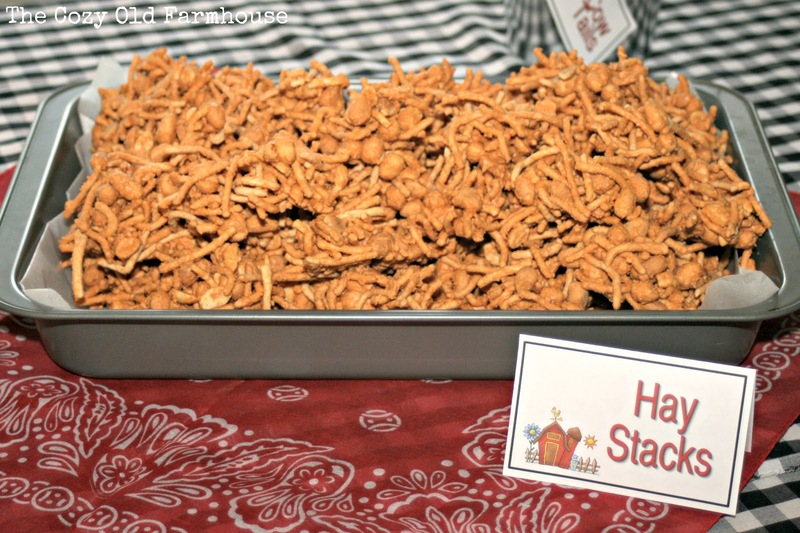 My mom made her Hay Stacks (a tasty concoction of pretzel sticks, peanuts, and peanut butter). 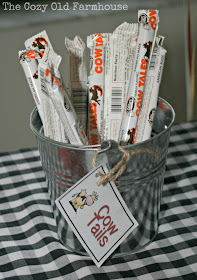 Also on the cake table was a little bucket of "Cow Tails." The little buckets were leftover from my wedding. 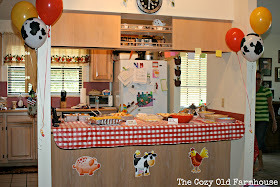 We set the rest of the food up on the kitchen island area. 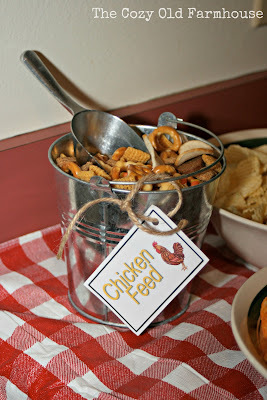 "Chicken Feed" was basically just Chex Mix. 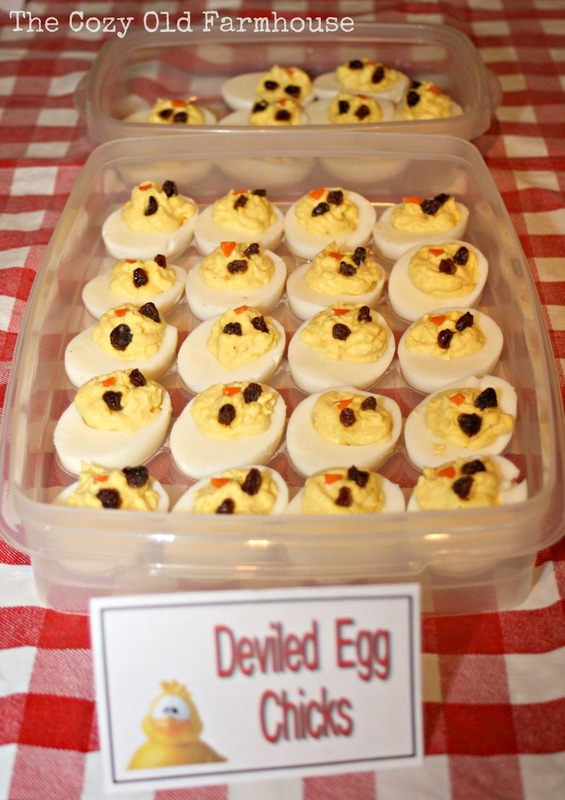 My sister brought deviled eggs made to look like little chicks. I didn't realize until after the fact that they were sitting there upside down. They should have been facing the other way. 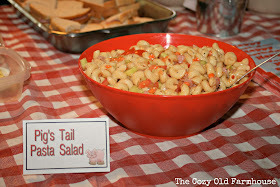 "Pig's Tail Pasta Salad" was just a basic pasta salad recipe, but made with corkscrew/curly pasta. And of course, we can't forget "Pigs in a Blanket." 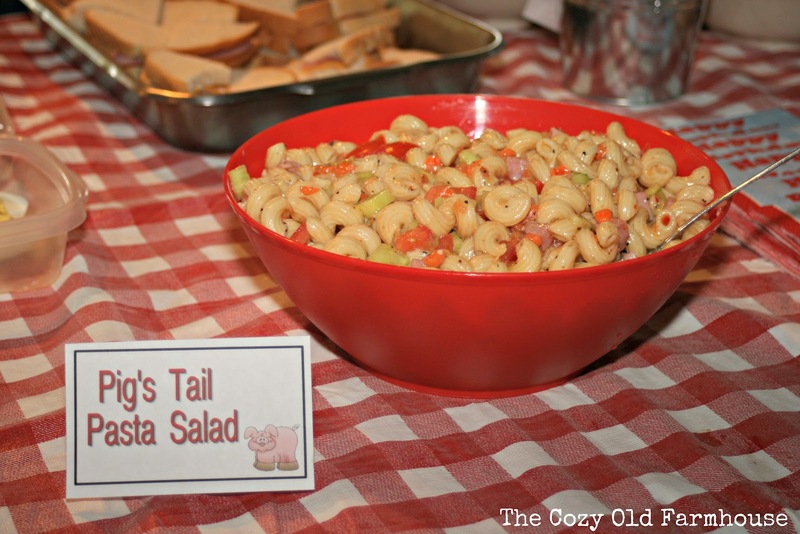 We also had "Farmer's Corn on the Cob" and chicken nuggets, though I guess I didn't get a picture of those. This was the set of plates and napkins I ordered. 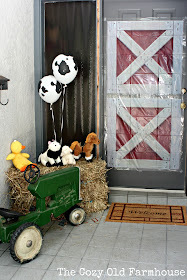 I also got the cow balloons, barn door, a game, and animal cutouts from the same place. 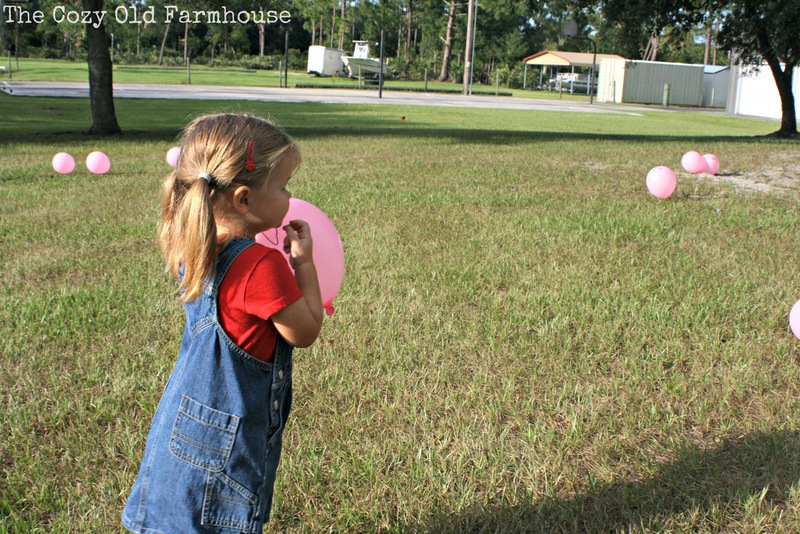 Since most of the child sized guests were around the same age of 2 or so, I had to come up with games that would be on their level. 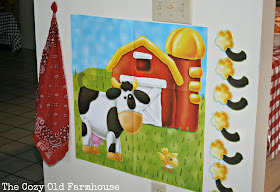 Pin the Tail on the Cow was played, though we didn't blindfold the littlest ones. 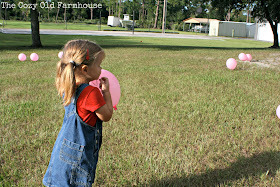 We also did a fun little game outside called, "The Pigs are Loose!" 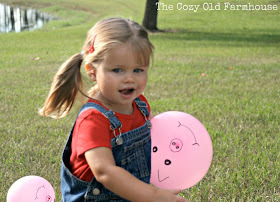 I blew up a bunch of little pink balloons and drew pig faces on them. 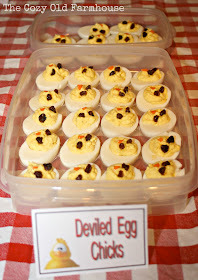 We then placed them in a container (my in-laws had a squirrel cage that worked out perfectly). We explained to the children that GASP! 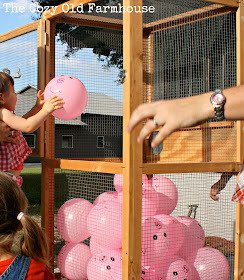 The pigs were all escaping from their pen! Their job was to round them all up and bring them back. We then scattered the "pigs" all around the yard and they ran like crazy chasing them and bringing them back. They had so much fun with it, they wanted to do it over and over again. Here you can see the pig face a little better. And that's the birthday girl running with the caught piggy. 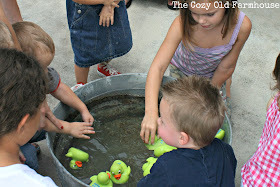 After getting all hot and sweaty from pig catchin,' they had fun cooling off with a water game. I placed little rubber ducks in a metal wash basin full of water. I don't even remember for sure now, but I think we did something like this. Each duck had a number on the bottom and each child got to pick out a duck. The number on their duck corresponded with a prize bag they got to take home. 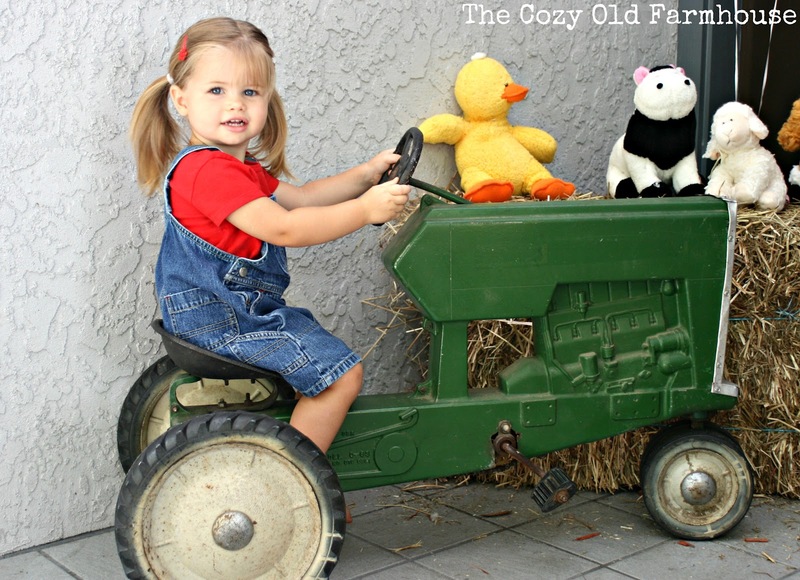 Here's the birthday girl again, checking out the tractor. I then used that picture to make photo thank you cards on Walmart.com. I know I have an extra one somewhere that I saved, but I'm not exactly sure where at the moment. When I come across it, I'll add a picture of it. 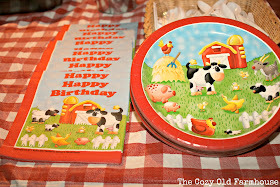 But there you have it, a Barnyard 2nd Birthday. Now I'm gonna get to workin' on those cabin pictures! What a darling theme. 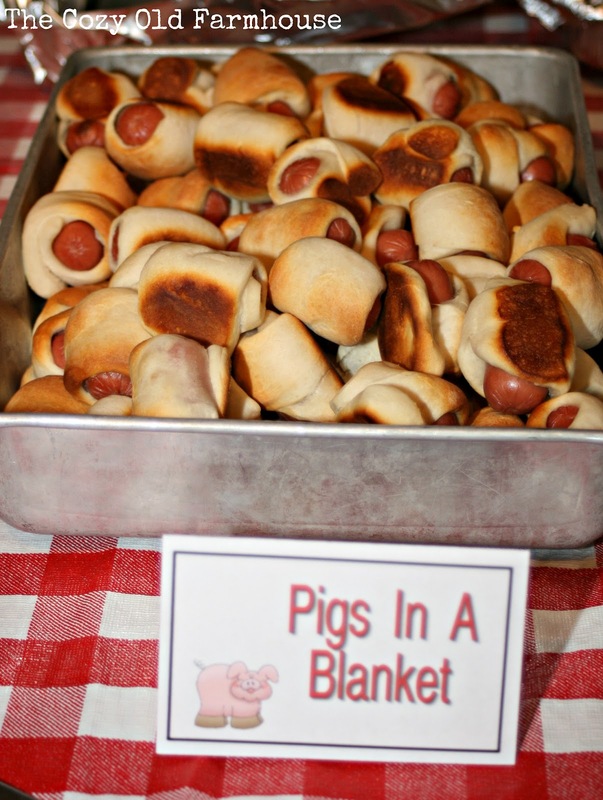 I can see this for a fun adult party too. Thanks for the great ideas. This entire party from start to finish is so adorable. Can I ask where you got the food labels from? If you made them would you be willing to share them? We are doing a baryard theme and I love to be able to use something like that to label the food. Thanks so much! Hi Melissa! You're a "no reply comment blogger" so I couldn't email you back about this question. I hope you see this. 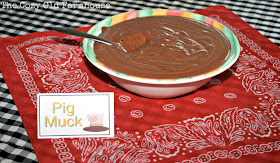 Yes, I did create the food labels, but I'm sorry I won't be able to share them. This party was actually from 3 years ago and I created them on our old computer that we don't have anymore. I would if I could though! If you have a simple card making program (I used Printmaster) they are fairly simple to create. I hope your party turns out wonderful! By the way, can I ask how you came across this post? It has been getting a lot of activity lately and I'm trying to figure out why. I didn't know if it's linked up somewhere or if it's floating around Pinterest or what? I found it on Pinterest and have pinned some of it :) You did such a great job! So creative, love it...thanks for the ideas! Where did you order the balloons and plates from? 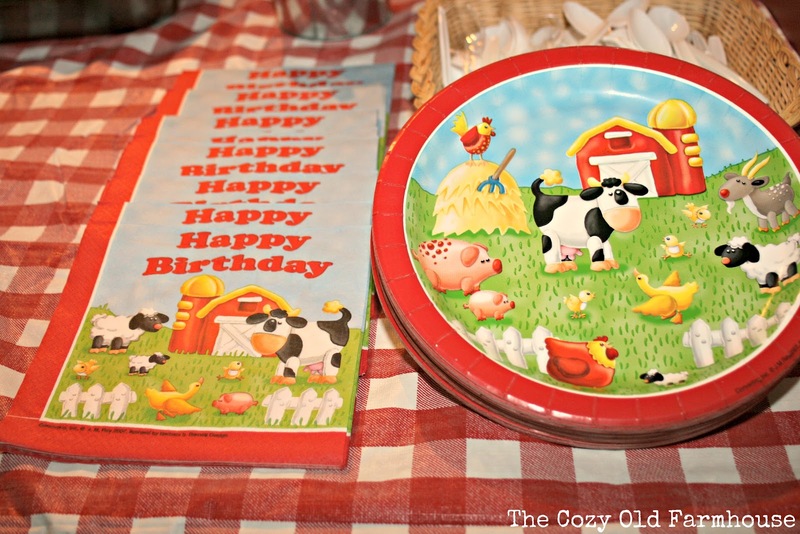 I love the plates and napkins, where did you order them from? I don't recall exactly where the plates, napkins, and balloons came from. They were most likely from one of the following sites: birthdaydirect.com, birthdayexpress.com, or birthdayinabox.com. This party was 4 years ago so they may not have exactly the same things anymore, but I'm sure you could find something else equally as cute. Thanks for stopping by and taking the time to comment. I love hearing from you!